Two-factor authentication used to be the domain of secret services and the military. The enterprise and consumer e-Banking and e-Government domains have since embraced two-factor (or: step-up) authentication. More recently social network sites such as Facebook and Google have started offering two-factor to protect their (free) services. Federations of higher education and research (operated by the NRENs) are still largely basing their authentication on username/password. A parallel development is that service providers in federations for higher education and research are starting to offer services that deal with highly sensitive information; for instance privacy sensitive administrative, research, or medical data. This is both a consequence of the success story of federations as well as the "move to the cloud" where traditional in-house applications like accounting systems are increasingly being outsourced to cloud providers. Because of the sensitive nature of the data in such systems, stronger forms of authentication are necessary. NRENs such as SURFnet have noticed these trends, and the discussion of how to best approach two-factor within a federated setting is now in full progress. An Identity Provider (IdP) within a federation is ultimately responsible for providing the identity of its users. This includes authentication and the IdP can make authentication as strong as it wishes, of course. The case for two-factor in a true federation is, however, significantly more complex than rolling out two-factor in a situation where Identity Provider and Service Provider coincide (such as in e-Banking or the enterprise), as information about the Level of Assurance is shared with and interpreted by Service Providers in the federation. Introducing multi-factor authentication within a federation is really only sensible if registration (enrollment of an authentication token) procedures also warrant a strict higher level of assurance. Novay, in close collaboration with SURFnet, has made an initial design for a service to assist Identity Providers in the introduction of two-factor authentication solutions that can be used across the SURFconext federation. The report describing the design is available for download from the SURFnet website. The report describes both the technical (architecture, standards) and the procedural (registration, logging, de-registration) challenges. which standards (and what choices within those standards) should be used for uniformly signaling the level of assurance from Identity Providers to Service Providers. As for the location of the service: in a SAML based hub-and-spoke federation (such as SURFconext) it makes sense to base (the initial version of) the service as a transparent proxy on the Service Provider bound exit of the hub (as shown above). This separates the service from the hub. It also means that the Identity Providers and Service Providers can remain unchanged, except for Service Providers that need to deal with higher levels of authentication. The paper builds a case for this simple architecture. As for the standards to use: there are many variations on levels of assurance frameworks. To name just a few: NIST SP800-63 for the US and STORK for the EU. The best option, at this moment, would be to standardize on the upcoming ISO/IEC 29115 standard which will unify some of these standards. SAML 2.0 has had support for signaling details about the authentication process (and related processes) since its inception in the form of the so-called Authentication Context. This concept, however, leaves a lot of implementation freedom (and therefore interpretation freedom) for Identity Providers and Service Providers. Attempts to merge the Authentication Context concept with ISO 29115-style levels of assurance are relatively recent, and also appear in other authentication protocols such as OpenID Connect. The paper will give recommendations for how to best apply these standards. The level of assurance of an authentication token is not only determined by characteristics of the token itself, but also by the process by which the token is bound to an individual user by the Identity Provider. The paper recommends appointing a Registration Authority within the institute of higher education or research and making that person responsible for binding authentication tokens to users (staff, students) of the institute. The paper gives precise guidelines for setting up a Registration Authority. The most important recommendation is that individual users should visit the Registration Authority in person for face-to-face binding to the authentication token. The user should bring the token and a valid passport or identity card. The Registration Authority will check that these match with the user and with the attributes as issued by the Identity Provider. The Registration Authority also oversees an authentication attempt (with the second factor only) to make sure the user actually controls the token. The registration process is supported by an online service hosted by the federation operator. The service contains both a self-service user interface for end-users (so that most of the administrative process can be dealt with before the user actually visits the Registration Authority) as well as a user interface for the Registration Authority. The paper shows mock-ups for both user-interfaces. 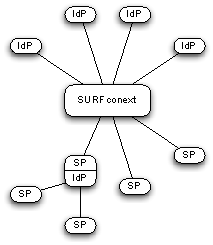 It is highly likely that the service proposed in the paper has broader applications beyond the boundaries of SURFconext. The architecture was described with portability in mind, such that the service can be re-used in other federations. Although the paper makes some concrete choices (to make it relatively easy to actually start building such a service) these choices are documented in the paper. The authors would like to acknowledge Ruud Kosman of Novay for designing the mock-ups and other colleagues from SURFnet and Novay for reviewing early drafts of the paper.